Besides the fullsize dipoles we offer shortened dipoles which are favorable when you have only limited space available. The shortened dipoles use extension coils made from Teflon cable. The stronger the shortening the smaller the useable bandwidth, in some cases an antenna tuner might be required. Like all Kelemen antennas the shortened dipoles are very light and weather and temperature resistant as well. Trap Antennas - what is that? By insertion of tuned circuits (traps) into each side of a dipole additonal resonances can be produced. Trap dipoles are usually a little bit shorter than fullsize dipoles and offer multi-band operation at places, where space does not permit to install larger antennas. But with such dipoles the larger weight due to the traps has to be considered: traditional traps have a high weight and lead to much higher tension forces of the wire, the antenna has a sag in the middle. Due to the loss of average height the radiation angle climbs and the efficiency drops. So it is important to manufacture traps with as little weightas possible. Further, trap dipoels are no wide band antennas: The SWR climbs rapidly when working off the resonance frequency. In some cases the use of an antenna tuner is required. The location of a trap dipole is more critical than with monoband dipoles. The antennas should be placed (as with any antenna) as high and as free of obstructions as possible, to avoid shifting the resonance frequency. Install as far away from buildings as possible. As a reference height for the design of the Kelemen dipoles we assume an average height of 10m above ground. 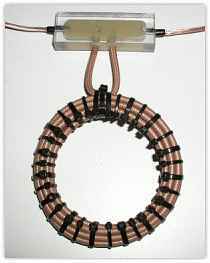 Kelemen antennas are wire antennas with traps made from teflon isolated coaxial cable. The coaxial traps are very light compared to traditional traps, allowing a better average height above ground. Many portable operations prefer these light antennas because a simple glassfibre pole is often sufficient to lift the antenna. The special traps of Kelemen antennas have a high Q and therefore low losses. All baluns come with a lug for installation. If, due to space limitations, the antenna can not be installed in a horizontal manner, the inverted-V mounting is a good alternative. The radiation angle is lowered and more suitable for DX, and only one center pole is required for installation. The angle between the two dipol side should be between 90 and 130 degrees, and it should not be less than 75 degrees. The ends of the wire should not touch the ground but end some meters above ground, perhaps they require extensions with insulating rope. Kelemen antennas are manufactured from high quality materials. All cast parts are milled from weather proof polycarbonate; all hardware like screws, washers, nuts and clamps are made from stainless steel. Our baluns have a bolted, clear polycarbonate case and are not filled with insulating plastic like other baluns. This makes the production of these baluns much more expensive, also because we still have to make the baluns weather resistant, but this method has a clear benefit: In case of an 'accident' you can fix the balun yourself. And it is much lighter than other, conventional baluns. Included in delivery: Antenna ready to use incl. balun with PL socket and incl. insulators. Kelemen antennas are made for power loads from 200 to 2000 watt, depending on model, see table. 4-Band portable Wire Groundplane following the Kelemen principle. For 40/20/15/10m coil, winds up to a tiny package, lightweight. Basically the antenna consists of half a Kelemen antenna and a radial set (1 radial per band, fine to add more yourself). With the antenna and a fibreglas mast you'll be on air on all 4 mentioned bands QRV in a flash. The feed has a PL female connector. Length of radiator 5.8m, weight 670g, power rating 400W. We recommend to put the radials not directly on the ground, but rather to have the antenna base at 1-2m height and wire up the radials diagonally down near to the ground. The ends of the radials should NOT be grounded then! Our baluns have a bolted, clear polycarbonate case and are not filled with insulating plastic like other baluns. This makes the production of these baluns much more expensive, also because we still have to make the baluns weather resistant, but this method has a clear benefit: In case of an 'accident' you can fix the balun yourself. And it is much lighter than other, conventional baluns. Each balun has a hook formounting and is equipped with a PL socket. For easy installation of baluns on a horizontal or vertical tube up to 50mm diameter. Solid aluminium plate, complete with 3 sets of U bolts and mounting hardware, all stainless steel. Of course also suitable for other baluns with max. 50mm diameter.